The Panamax M8-AV provides protection for your audio/video components, including cable or digital satellite TV systems. The Panamax M8-AV provides protection for your audio/video components, including cable or digital satellite TV systems. This power conditioner shields against harmful spikes and fluctuations in your home's AC power, and filters out the RF (radio frequency) and electromagnetic interference that can degrade your system's performance. 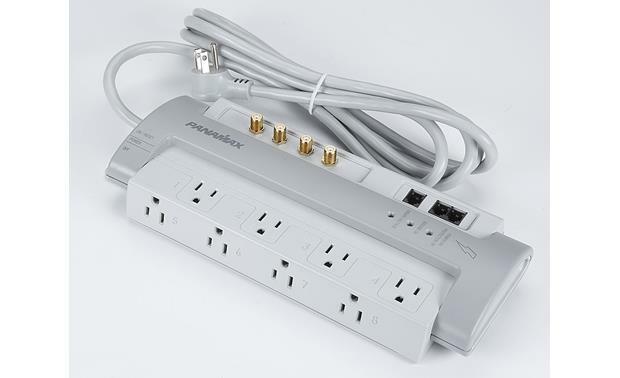 The M8-AV features eight fully protected AC outlets, conveniently spaced to allow for bulky transformers. You get two sets of protected coaxial input/output jacks for cable, antenna, or digital satellite TV connections. The M8-AV also has one set of in/out jacks to protect your telephone connections. The M8-AV reacts to a voltage spike in less than a nanosecond, breaking the connection to protect your equipment. The 8-ft. power cord has a right-angle plug that hugs the wall, for an easy fit behind a chair or sofa. You can also mount this conditioner on your wall for out-of-the-way placement. Is the Panamax M8 AV 4K compliant? Does it need to be? I do not know what is meant compliant....I just ordered by the product description. So far, so good - although I do not believe we have had an surge through the line. 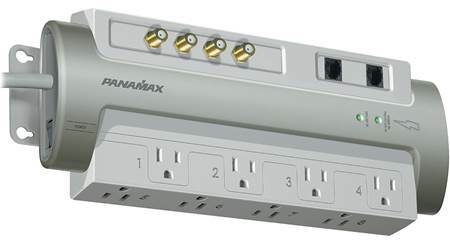 Overview: The Panamax M8-AV Surge Protector features 8 AC outlets controlled by the unit's power switch. The M8-AV also provides protection for coaxial and telephone connections. 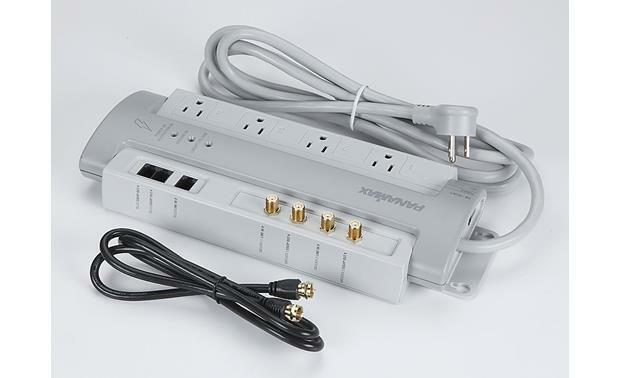 In addition, this surge protector is equipped with 3 diagnostic LEDs. AVM Automatic Voltage Monitoring: The Panamax M8-AV utilizes an AVM (Automatic Voltage Monitoring) system to protect your connected equipment against prolonged over/under voltages by disconnecting the power and reconnecting it when safe power returns. The Panamax M8-AV will protect your AV system from catastrophic surges. 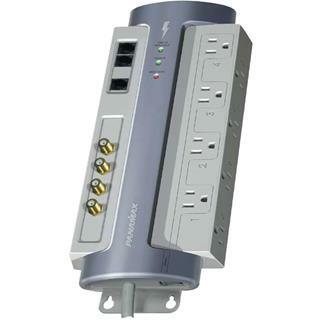 Lifetime $5,000,000 Connected Equipment Warranty: Panamax will replace or repair equipment that is damaged by an AC or signal line surge while connected to a properly installed Panamax surge protector (up to $5,000,000). 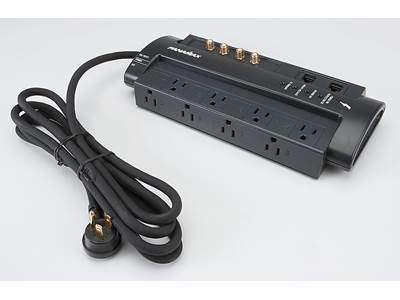 Power Cord: The surge protector features an attached 8 ft power cord with a right-angle, 45-degree offset three-prong plug. 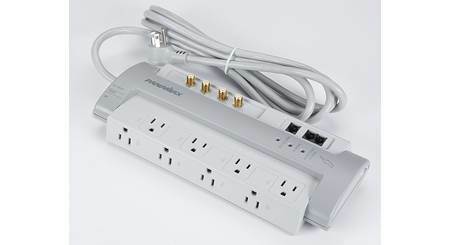 Mounting: The Panamax M8-AV Surge Protector can be placed on the floor, on a shelf, or inside a cabinet. The M8-AV can also be wall-mounted using the integrated wall-mount brackets, key-hole slots, and supplied hardware. Telephone: One telephone line input and two telephone outputs (RJ-11 connection). Unsafe Voltage: Red LED, indicates that incoming voltages are unsafe and the surge protector has disconnected the power to your connected equipment. 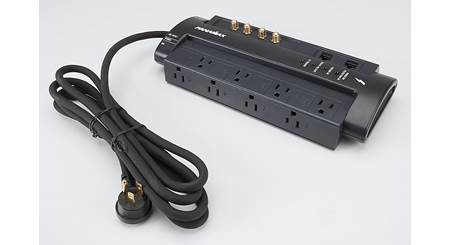 Why are the joules low compared to other surge protectors like tripp lite? Thanks for your question. For more info on comparing two or more models, you would be better served reaching out to an Advisor directly by phone (1-800-324-9695) or online chat. They can go over the differences in more detail to help you make the best choice for your system and your budget. As far as I know and can tell no surge protector will effect your 4k capabilities since all 4k devices have the 4k capable items built into the device it self. In fact with my own research it seems a surge protector with a filter will more than likely make your 4k tv look even better. I have no idea why Crutchfield wouldn't have answered this question for you as it seems pretty simple but by not doing so you either might not order one from a them or even worse might not order this I and a 4k tv. 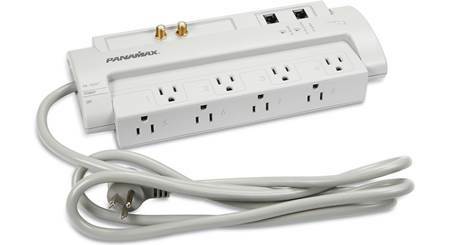 Searches related to the Panamax M8-AV Power line conditioner and surge protector.